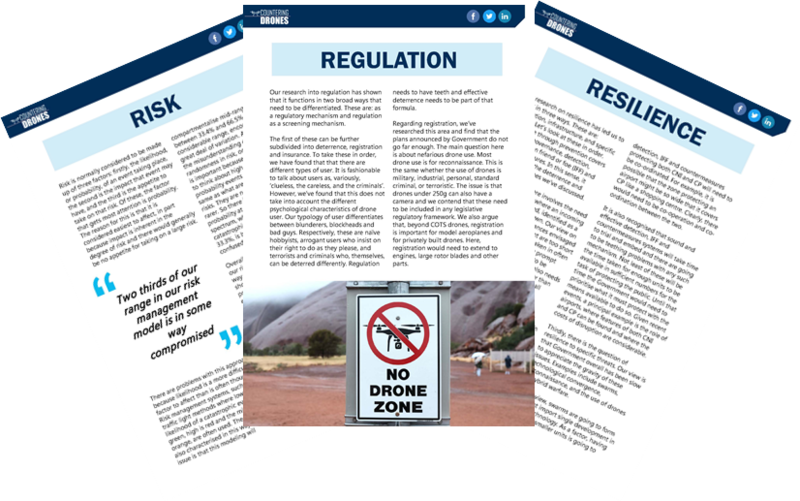 In this exclusive opinion piece, the researchers behind the ‘Red Teaming Report’ on ‘The Nefarious, Criminal and Terrorist Use of Drones’, Professor David Dunn and Dr Christopher Wyatt from the University of Birmingham, explore the challenges surrounding countering drones in the civilian space. Leaders of this year’s Countering Drones Conference workshop on ‘Helping security professionals understand risk, regulation and resilience to counter the accidental or unlawful misuse of drones’, they delve here into the three main themes that will be the core focus of the day: risk, regulation and resilience. In this exclusive infographic, discover what has changed in the drones industry. What stage are they now at regarding the engagement and counter-drone technology currently available on the market? What is their opinion on their country's legislation's response to the threat? Has the communication between the government and the public improved since last year?